Itemis-jas-pa 38-1 - Portrait photo of Donald "Curly" Phillips. Itemis-jas-pa 38-2 - Outfitter Donald "Curly" Phillips as a young man. Itemis-jas-pa 38-3 - Daniel Alven Phillips, with his repeater hunting rifle. Itemis-jas-pa 38-4 - Mrs. Dorothy Phillips, mother of Donald "Curly" Phillips. Itemis-jas-pa 38-5 - Daniel Alven Phillips in front of a log cabin. Curly Phillips (1884-1938) first came to Jasper in 1909 outfitting for Rev. Kinny's attempt on Mt. Robson and A.O. Wheeler's survey of Mt. 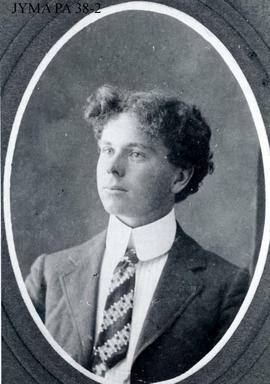 Robson (1911). He settled permanently in Jasper in 1912 setting up an outfitting business. Over the years he worked on many Alpine Club of Canada camps in the area. He built a twenty foot canoe (1921) at Maligne Lake and later a 24 foot power boat (1927). He secured a lease to operate boats on Maligne Lake (1928) and built the boat house which still stands today. He married Grace Inkster (1923). They had three children; Sam (1928), Joy (1930) and Ivy (1932). 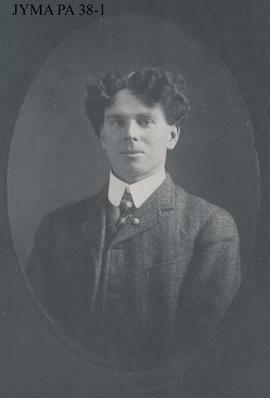 Curly Phillips was killed in an avalanche in 1938. The collection consists of photographs pertaining to Curly Phillips life. Includes many C. Phillips photos as well as several from other sources.